David Burney is a native of Oklahoma City, Oklahoma. He holds a Master’s in clarinet performance from The University of New Mexico (UNM) in Albuquerque, New Mexico under distinguished soloist Keith Lemmons, and a Bachelor of Musical Arts from The University of Oklahoma in Norman, Oklahoma under the late renowned pedagogue Dr. David Etheridge. He has also had additional studies with Dr. David Carter, principal clarinet of the Tulsa Symphony Orchestra, and József Balogh, principal clarinet of the Budapest Radio Symphony Orchestra. 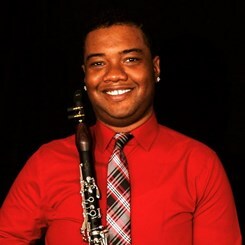 While working on his graduate degree, Mr. Burney performed as Principal/Assistant Clarinet in the UNM Symphony Orchestra, and was also involved with the premier of several new works with the UNM Wind Symphony including a new trombone concerto featuring Joseph Alessi, principal trombone in the New York Philharmonic Orchestra, and Marshall Gilkes, world renowned jazz trombonist. Notable playing engagements during his studies in Albuquerque include performing as Assistant/2nd clarinet with the New Mexico Symphony Orchestra and recording an album with the UNM Wind Symphony featuring J.D. Shaw, principal horn of the Boston Brass. Mr. Burney is currently a freelance musician in the Dallas-Fort Worth where he maintains an active and strong private clarinet studio. He teaches clarinet/bass clarinet and masterclasses in Prosper, Lovejoy and Plano ISD’s while also performing with local orchestras such as the New Texas Symphony Orchestra. He is also a research specialist, and his current research is focused on the compositional processes that have been made in the transcription of popular clarinet literature to other instruments. David teaches at the Allen Music & Arts on Mondays.